Several weeks ago I got an email from Mom Select asking me if I would be interested in hosting a Gutzy Gear party. A what I wondered aloud. Enter my tween daughter Ms. M, who immediately said,” say yes please! I’ve wanted to show you the commercial for those”. Thankfully, I was chosen. Gutzy Gear is a great, new way to express yourself by customizing your back back, sports duffel, messenger bag, and more! Gutzies are cool looking removable patches. Gutzies stick to a Gutzy strap cover that you put wherever you want to go Gutzy! With 56 Gutzies in a series and new Gutzies constantly being introduced, you can collect and trade a world of Gutzies. Fast forward to Saturday afternoon. What do you get when you have a group of tween girls, games, snacks and Gutzy Gear? A fabulously fun afternoon filled with lots of giggles and bonding. It’s amazing what you can learn about your kids and their friends when you sit back in another room and let them be creative. The girls loved drawing versions of Gutzy Gear patches. Even though we could have played Gutzy Bingo, or a matching game, the drawing was a hit. I got to be the “judge” and pick my favorite drawings to see who got to draw their Gutzy patches from the grab bag first. That was a really fun part for me because I loved seeing how creative and talented they were! After the drawing was done, the girls ripped into the patches but only after a few trades had been made. They loved how soft the straps were and all of them commented on helpful they were going to be with their heavy backpacks. If you’ve ever hefted your 4th graders backpack, you know their shoulders could use the T.L.C. Afterwards I served a light snack and much to the girls surprise 2 hours had past and it was time for them to pack up. We had a blast at our Gutzy Gear party and would highly recommend them as a fun, creative activity for a sleep-over, birthday party, or play date. 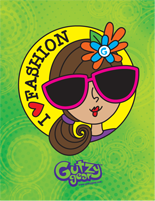 And, Moms- Gutzy Gear isn’t just for girls! They have the boys covered too. Head on over to Gutzy Gear and check out their current buy 1 get one get 1 free deal. Also, between now and September 7th, your kids can win 1 of 100 Toys ‘R Us gift cards, worth more than $5000 by showing us how you “go gutzy”. Visit their Facebook page HERE for more details. Thank you to Mom Select and Gutzy Gear for sending me a home party box to host this party. I was not compensated. All opinions are my own. What a great idea. I used to do all kinds of crafts with my daughters PLUS I was a Girl Scout leader (many years ago). Nice and easy with everything you need. Wow! I see this in my future in a couple years when my 5-year-old is older. Looks fun. Gutzy Gear is very neat. Great for this time of year and back to school. I bought some patches for my neices. Fun to trade and collect. Sounds like our were one busy Mom who would have thrown an awesome party! Thanks for stopping by. Yep, this was a lot of fun. Your daughter will be at this stage before you know it. Enjoy that magical place you and she are in right now! Yay! You already know about Gutzy Gear. The patches are super cute. I want to get Ms. M a couple more. She really wants Whiskers. And what a fun way to have real tween bonding happening! I dream about what my daughter will be like when she's a little older. I always forget about the fun activities that we can do together. Oh girly stuff, I love it!! What an awesome idea.. I have not heard of this but if my kids were younger they would love it.. Thanks for sharing.. Thanks for stopping by. I am so glad Ms. M knew what Gutzy Gear was or I might have taken a pass on this opportunity. It was alot of fun! Raising Girly-girls is a whole lot of fun for me. As your daughter gets older a whole new world will open up for you and her. Soon you will find yourself immersed in froo froo! They are neat and they have really cool boy patches too! Thanks for stopping by and commenting! Thank for visiting and commenting. I was very lucky indeed to have gotten this party! I enjoyed my visit to your blog and subscribed to you as well. Like minds it seems.